So far, E has been the most difficult letter in the ABC-Along. I’ve been rolling ideas around for days, indecisively, but it wasn’t until this afternoon that the right E came to me. E is for Emma. I hadn’t planned on trotting out pictures of all my old pets, but this is Emma, for goodness’ sake. 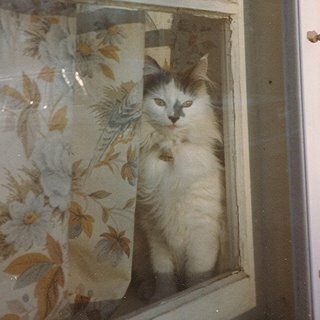 She came to me in 1983, fluffy gray tail and all, and stayed by my side until 1999. She was a little thing, very long haired, quite talkative, a bit sassy, and often persnickety. But she was also, along with my dog Jillaroo, a wise and steadfast companion. She had a habit of staying close and watchful, often on my shoulder or in my lap, and being my little fur guardian. She’s still watching out for me, she is. I take it for granted that she is on the bed at night, next to the pillow, and Annabelle seems to know it, too. How many times have I felt a cat walking across the covers, only to look down and see that Annabelle’s not even there? It’s Emma, come to sleep by my head. Emma was also, apparently, a good sport. 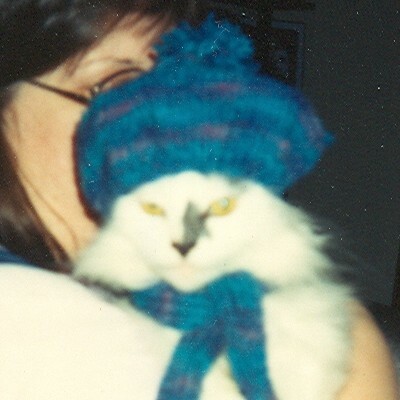 This is a picture that should embarrass the average cat (or the chaotic kind), but she must have “agreed” to pose in a teddy bear hat and scarf I made for one of the kids. I think my niece, the Big R, took this picture when she was about eight years old. Emma was about nine. I’m sorry, Little One, but it fit you perfectly. Not a day goes by that I don’t remember something nice about Miss Emma. Finding this picture made my day! Now and then, Pokey peeks in through the front window, then laughingly looks over he shoulder as he dashes around the curve in the lane. He’s telling me “oh come come! It’s so wonderful here”May you be blessed with Emma’s love forever. What a great picture, and a perfect E. I had the same problem with D. I didn’t even know her, but it makes me smile to think of Emma still hanging around near you. What a lovely post Jane – I too am a cat lady – they are mysterious, wonderous creatures that grace our lives for a time. We are lucky to have them. Emma is so lovely – and I’m sure she still sleeps near your shoulder when you knit. It amazes me to think that Miss Emma would sit still for that. What an extraordinary kitty. And a beauty! Thanks for the memory! Cats are surprisingly tolerant of their owners’ silliness, aren’t they?! Thanks for sharing Emma’s story – I love that she is still with you, watching out. What a lovely tribute. Even though I love my two kitties dearly, not a day goes by that we do not miss Ernie. You never forget the great ones and how they touched your life. PS – I stopped by via Chris at Stumblingoverchaos. She sent me a link to your Madeleine L’Engle quote.